It is amazing how one of the first things listed on the websites of mining companies is their history of contributing to the environment in a just and sustainable manner. It is equally amazing how many people believe these lies. In Costa Rica, land of the “eternal rainforests” and beacon of ecological sustainability, the current President, Laura Chinchilla, can be included in that group of people. She claims, the day after the country has banned new open-pit mining projects, that the time has come for the protected land areas to be developed. Fortunately, the “radical groups” that Chinchilla speaks of, encompass the overwhelming majority of the country. In fact, the percentage of Costa Ricans that are against the Crucitas open-pit gold mine is between 80-90%. Let us hope, then, that these people act out against these absurd statements. So far, opposition groups (including students of all ages, lawyers, members of the Dept. of Treasury, clergy, and even the Legislative Assembly, and courts of Law) have led several marches spanning almost the length of the country, have held hunger strikes lasting over 25 days, have written innumerable letters and reports, have filed lawsuits and have organized concerts to demand that President Chinchilla annul the permits for the mining operation. As of yet, 17 years after the project began, only temporary halts in operation have occurred. 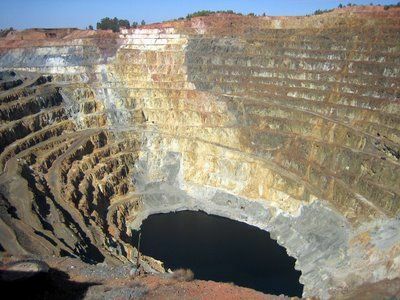 In order for the open-pit mining of Crucitas to operate, at least 15,000 trees will be destroyed in a primary forest. Open-pit mining consists of blowing off the top part of the resource-rich mountain (in this case, gold) using dynamite, excavating huge pits with heavy machinery, then using toxic chemicals, including cyanide, to wash apart the gold from the mountain remains. Among these 15,000 trees is the yellow almond tree, home to the green macaw parrot, both of which are found on the list of endangered species threatened with extinction, along with sixty other endangered species native to the area. The mining operation requires over 30,000 liters of water per hour and requires the transport and storage of cyanide, lethal in doses of 200ppm to large mammals, but lethal to aquatic life in doses as small as 0.1 mg/L. A toxic soup is required to process the dust that was the mountain in order to extract the gold, and this toxic soup is easily washed down due to the country´s extensive rainfall and heavy winds. A frightening addition to this point is that the Crucitas mine is located near the San Juan river (natural border with Nicaragua) which feeds directly into the Caribbean Ocean within less than 100 miles, and is home to bull sharks and a plethora of other animals. 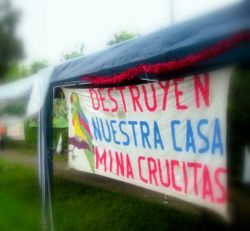 Currently, the Supreme Court of Costa Rica (Sala IV) is attempting to prove whether the permits for exploitation granted to the mining company are legal. (This is the second lawsuit filed against the project, and during the trial all mining activities are temporarily halted.) Since 1993, the mining zone has been owned by Canadian mining companies (first Placer Dome, then Lyon Lake Mines, then Vanessa Ventures, finally Infinito Gold) who, in 2001, created a Costa Rican subsidiary in order to bypass a law restricting mining to only national companies. The subsidiary named Industrias Infinito, conducted their environmental impact report one year after the permit was granted, and though they claim on their website to be 100% Costa Rican, they are financed, managed and controlled by the Canadian company. The main point being argued in the current trial between the environmental organizations (including Aprefloflas, UNOVIDA, Procuradoría Ambiental) and Infinito is whether the mining project is in the best interest of the country, i.e. 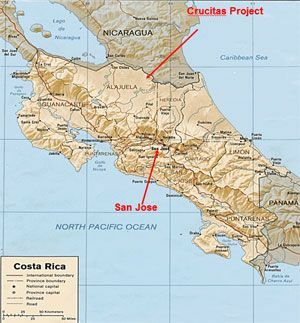 whether the environmental impact of the open-pit mining outweighs the benefits it gives to Costa Rica or not. Most people who have heard of Costa Rica think of “eco-tourism” and in fact this is one of the main industries within the country, offering thousands of jobs to locals, and bringing in almost $2 billion each year to the local economy. Obviously there are problems within the eco-tourism market (exemplified by cable tours through the rainforests, that require chopping down trees to install them) but for the most part it is based on a love for nature and requires that the flora and fauna just be left alone so that tourists from all over the world may enjoy the little bit of wildlife that is left in our industrial world. For some reason, however, President Chinchilla argues that the time for nature preservation is over, and it is time, instead, for development. Environment aside, the main reason given for allowing Crucitas to maintain in operation is money: the costs of canceling the permits and paying the damage fees to Infinito are supposedly too high for the current administration to consider them. From 1993 to 2008 alone, it was estimated that $34 million had been spent on research, equipment and exploration of the Crucitas area, by the Canadian companies. Therefore, if the project´s permits were cancelled, the company would demand this amount and more to be paid in retribution. Fortunately, Costa Rica has a history of refusing to pay private companies for their exploitative damages to the land, and there is no reason they cannot do so again. In 1997, Harken Energy Co. (owned by George W. Bush at one point) began exploring crude oil projects in Costa Rica and when their environmental impact statements were rejected by the administration, they sued the country for $57 billion in damages. 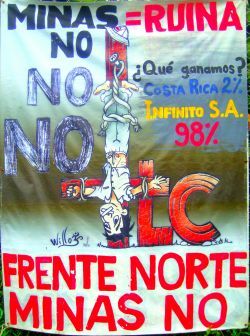 After involving international trade organizations, furious that Costa Rica was enforcing its own environmental laws, Harken was told by Abel Pacheco, the president at the time, that Costa Rica would not be paying any of the demanded money. He simply refused to acknowledge their decisions. In other words, if radicals is what you think we are, then maybe as radicals we should behave.